After dropping the Freeway Series against the Angels, the Dodgers definitely wanted to have a nice rebound game against the Padres, who were coming off a 16-inning marathon. Thanks to a big inning and stellar pitching, they did just that in a 8-2 win. After struggling mightily in the series against the Angels, things didn’t start off much better for the offense against the Padres, as Luis Perdomo got three shutout innings to begin his night. Thankfully, the fourth inning happened, and it resulted in five runs. The first five batters of the frame went Cody Bellinger double, Matt Kemp walk, Yasmani Grandal double, Chris Taylor single, and Andrew Toles double, plus a wild pitch and CT3 steal got thrown in the mix. By the end of that sequence, four runs had already crossed the plate. They weren’t done, however, as Clayton Kershaw advanced Toles to third on a grounder, and then another grounder from Joc Pederson allowed Toles to use his speed and make it 5-0. Meanwhile, Kershaw took to the mound, continuing his march back to health. He turned in a quality start, going six shutout innings on 89 pitches, allowing just two hits and a walk while striking out five. That said, it’s somewhat concerning that Kershaw’s fastball velocity seemed to back off a tick to around 90 mph, and he just isn’t getting as many swing and misses as we’re used to seeing from him. The bats came back out to back Kershaw in the 7th, as a Muncy walk and Bellinger double in the inning put runners on second and third with just one out. 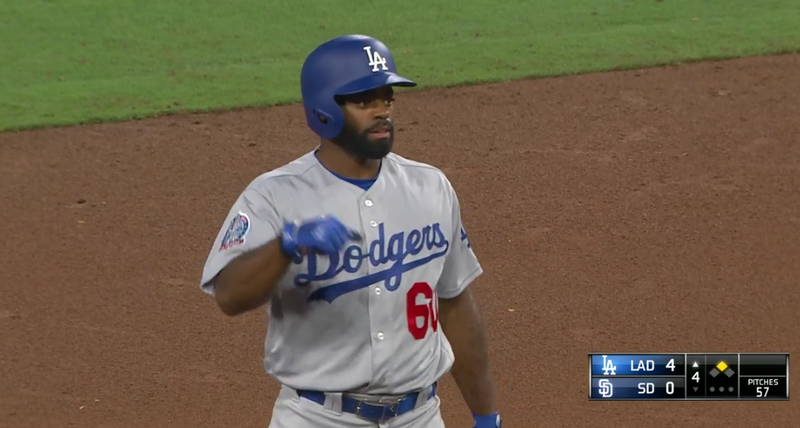 Kemp took advantage of that with a bit of situational hitting, hitting a fly ball to right-center to plate a run and make it 6-0. Erik Goeddel took over for Kershaw in the 7th, and continued to rebound from a rocky stretch, getting a 1-2-3 inning on two strikeouts and a ground out. While his upside may be limited, at this point any potentially quality middle reliever is useful to the Dodgers, and he definitely seems like he could play that role well. The Dodgers weren’t done scoring, as the 8th saw Toles and Chase Utley singling with Muncy walking, which led to the bases being loaded with two outs. JT cashed two more runs in with a single to left, upping the lead to 8-0. Caleb Ferguson then entered to finish the game off, and he looked mighty impressive in a 1-2-3 frame that included a strikeout in the 8th. The 9th started inauspiciously, however, as Wil Myers hit a homer to left to breakup the shutout. He also allowed a double and a single in the inning, but should’ve escaped without any further damage. However, a Muncy error allowed a run to score and the inning to continue, before Ferguson finally slammed the door shut to avoid potential disaster. Andrew Toles don’t blow out your ACL again challenge. 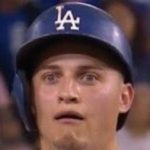 Enrique Hernandez and Matt Kemp make memes of themselves. The win improves the Dodgers to 49-41 overall, and gets them to within a half game of the idle Diamondbacks in the NL West. Rich Hill will look to continue his quality run after coming off the DL tomorrow at 4:10 PM HST/7:10 PM PST/10:10 PM EST while squaring off against Eric Lauer.